Bullzip PDF Printer is an excellent, free virtual PDF printer which can create PDF documents from virtually any other document from a program with a print function. 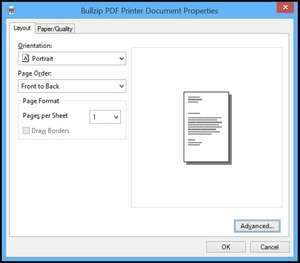 Bullzip PDF Printer installs itself as a printer in Windows and once complete, adds a configuration tool to the Start Menu. Accessing the configuration provides a wide array of tools for dealing with the PDF files it creates. For one, the free version of Bullzip PDF Printer can create password-protected files which are encrypted with varying degrees of strength. Version 11.9.0.2735 is a freeware program which does not have restrictions and it's free so it doesn't cost anything. For security reasons, you should also check out the Bullzip PDF Printer download at LO4D.com which includes virus and malware tests. Additional screenshots of this application download may be available, too. 3 out of 5 based on 39 ratings.